Event organizers are adding their competitions. Events calendar is build on that basis for different regions. Organizer indicates when to open and close online entry for his event. Any user can view a calendar of events and submit his registration claims to participate in the activities. To make an online entry, you need to log in to our system. Applications for the sport competition can be made from a certain team, either in person or on the national team of a city, area or regions of Russia, Ukraine, Kazakhstan and Belarus. Also available online-entry of athletes from any other country of the world. All types of application forms allow you to enter multiple participants at one time. 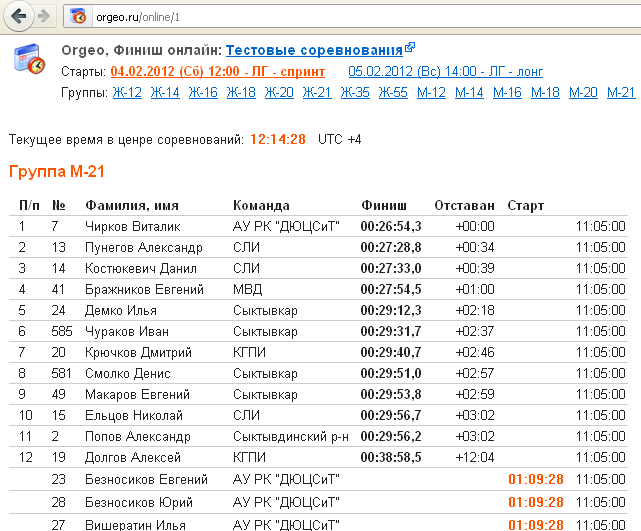 Event organizers can arrange online broadcast of competition finish results with the help of Orgeo.ru service. Currently is available broadcast from WinOrient and SFR event center programs. Organizer just need to create competition, upload the start protocol into it and make some simple settings in the program. The configuration process of online broadcasts is described in our FAQ. Broadcast the results from the finish-line. To register as an organizer, you should log in to our system, and after that submit Request for organizator rights. If you would like to add another sport, please contact us about this through our feedback form. Widget will show upcoming events of desired region and/or type of sport. Generate Widget for Your site. 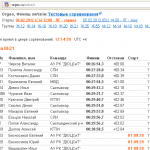 System Orgeo.ru is represented in following social networks: . You can subscribe to the newsletter or joining our group there. A more detailed description of the system and information on new developments can be found in our blog about Orgeo system (in russian language). If you have any ideas to improve functionality or have comments, you can express them on a special page Ideas. 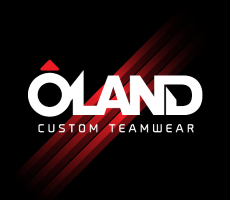 If you have any question you can contact us through our feedback form. Want such informer on your site?